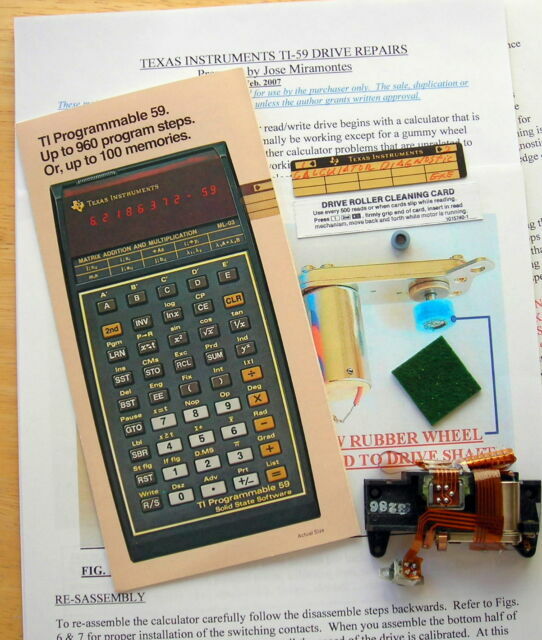 One of the earliest programmable calculators in the world, the Texas Instruments Ti-59 has loads of exciting features. For instance, besides solving your every day math problems, you can also play a Hi-Lo game or chess on your Texas Instruments calculator! The Texas Instruments Ti-59 has small magnetic cards that can store programs and data when this programmable calculator is off. This Texas Instruments calculator uses ROM Program Modules, an insertable ROM chip capable of holding 5000 program steps. The numbers on the Ti-59’s screen can be easily viewed, thanks to its red LED display that could show 10 decimal digits of precision. These battery packs work great with old Texas Instruments SR-50 and SR-51 (and their A variants, the SR-50A and SR-51A) calculators. They recharge fine in the calculators and hold their charge for many months if they sit unused. Their construction is of new materials and they fit well in the calculators, though it can be difficult to get them to "snap in" on the hard-to-find SR-51 model and the SR-51A model. Sometimes I've had to remove the backs and snap the battery pack in and then put the back on the calculator. I used an SR-51 calculator with one of these that had sat for a year and a half and it worked immediately--no recharge needed, unlike the original TI NiCd packs. Calculator does not give correct answers on self check, NO key for printer! The TI-59 calculator and PC-100C printer were used by engineers in the late '70s and '80s. It is a great product and indispensable at the time. It was almost like a personal computer. This system allows you to make your own software programs or use existing modular programs. You can view the results on the calculator screen and/or the printed output. The used TI59s are wornout and there ios no replacement. I think the TI59 was the greatest programmable calculator ever. BUT. They have not aged well and my experience with used ones has been bad. TI regards them obsolete and has "better ones". I regard the modern ones the devil to use. AND alas, the computing community thinks ordinary people should not be allowed to program computers. They think they are entitled to union shops as we had 500 years ago. So be prepared to pay big bucks for specialty packages, or big bucks for Maple or hire a programmer. If you need to pass a SAT test, good luck. Casio Prizm FX-CG50 3D Color Graphing Calculator,16 MB memory, NEW in package!